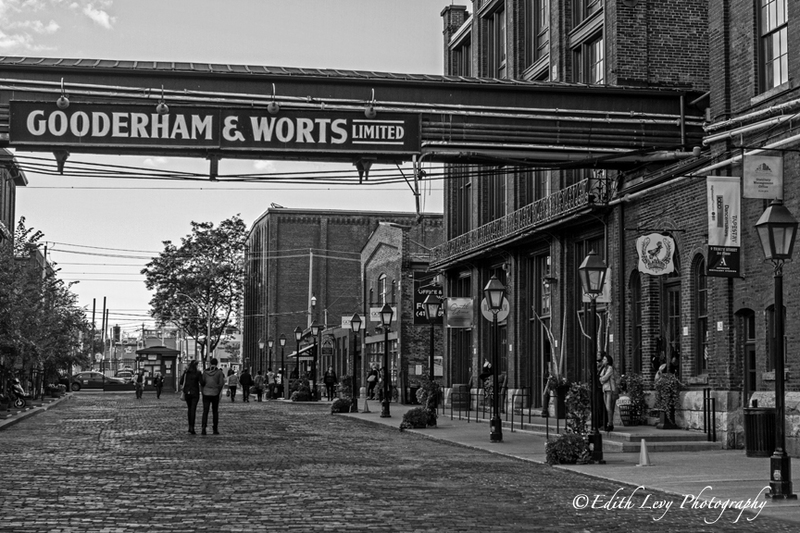 The Distillery District was once home to The Gooderham and Worts Distillery dating back to 183os. In its time The Gooderham & Worts Distillery played an important part in the growth and wealth of the city. James Worts emigrated to Canada from England in 1831 and established a grist mill (a mill for grinding grain). He was soon followed by his brother-in-law, William Gooderham who was a successful merchant in his native England. William decided to invest in James’ mill business and thus the Gooderham & Worts partnership was born. In 1837, spurred on by the increase in grain production at Upper Canada farms, William decided to add a distillery at the mill and that year their first whiskey was produced. The distillery prospered over the years and the business grew to included a cooper shop, storehouses, a dairy, flour mills and a wharf. World War 1 had an almost ruinous effect on the distillery and just as things were starting to get back to normal Canada’s short-lived prohibition in 1920 brought alcohol production to a halt. Throughout the 20th century the distillery would have new owners and continue to thrive producing rye whiskey and then rum. After 153 years of continuous production the distillery closed in 1990. During the 90’s the distillery found new life as the number 1 filming location in Canada and the second largest outside of Hollywood. In total 1700 films were shot here among the gorgeous Victorian architecture. The 2002 musical, Chicago, was filmed here and one of the buildings stood in for Cook County Prison. In 2001 the Distillery was purchased and an ambitious restoration project ensued. The Distillery Historic District opened its doors in May 2003 and is today one of the most popular areas in Toronto. Click on the images to view a higher resolution version or to Purchase a Print. This entry was posted on November 5, 2014 by edithlevyphotography. It was filed under Around Toronto, Black & White, Street Photography and was tagged with 7D, black and white, Canon, distillery, Distillery district, Gooderham & Worts, long exposure, monochrome, night photography, Toronto, whiskey. Very interesting story that I didn’t know. That second photo – wow!! It’s perfect and it really caught my eye. Interesting story and I, too, love that 2nd image! Very interesting and wonderful that these places are preserved. The B&W is terrific and the warmth and clarity of the color images is masterful. The starburst lights are a bonus! Thanks Jane. It is a great place. I love the one with the open door. and the bike. It has such beautiful color coming from the inside. Thanks Phillip. That’s my favourite too. Love the vintage feel on this street, nice capture…. A photographer’s delight Edith. I love the last image particularly! Thank you Adrian. Always appreciate your comments. Thank you for including the history! History adds so much to the photos, in my opinion anyway. lovely! !